*Your pool deck can be poured immediately without waiting for the ground to settle eliminating a muddy, messy yard. *The Fox X-Brace technology is backed by an independent engineering report that proves the Fox X-Brace structural integrity is as we claim. Since 1957, Fox Pool has been an innovator when it comes to vinyl liner installation. They were one of the first to offer free form vinyl shapes in pool stairs, and liners that were not just blue. In today's world, these are very basic attributes, and we've come a long way with what can be done with a vinyl lined pool. Former gunite pool owners are now investing in a Fox pool. However, one item that has not changed is the Fox X-Brace design. X-Brace technology is not limited just to the Fox Pool. If you take a look around, you will notice, skyscrapers, bridges, and other architectural structures, going back centuries, all showcase a form of X-Brace support. Fox’s freeform panels allow you to design virtually any shape pool you want. Unlike other pool manufacturers, when designing and ultimately building the pool, we have the flexibility to create on site any shape or design. Our competition must order pre-fabricated panel kits. If there is a deviation caused by ground conditions, once excavation has begun, they must re-order the kit, if even available, based on your new requirements. 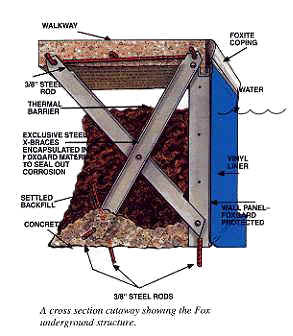 With our Fox pool design, we can change design right on site, and keep building causing no project delay. Combining the X-Brace support every four feet around the pool perimeter with the free form panel, gives you un-limited design potential along with unparalleled structural support and guarantees. These qualities can only be found in a Fox pool.